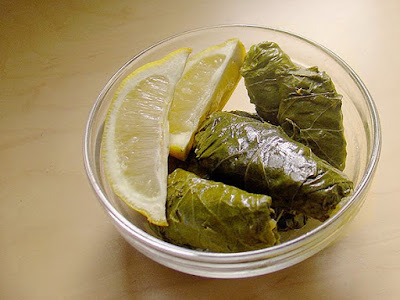 Some of you know stuffed grapeleaves as dolma, but in my home (half American-half Armenian/ Lebanese) we called them sarmas. The reason? Sarma means rolled and dolma means stuffed. I have an ancient memory of my father telling me that. My sarma has shredded vegetables, white wine, and parsley. Not traditional ingredients, but flavorful. I hold no recipe sacred. No food is safe from my kitchen meddling. This isn't an easy recipe. It involves multiple steps, and a little bit of a guessing game (How much rice goes in each leaf? How long to cook until the rice isn't chewy or too soft? Why is there extra water left in the pan) and time to manually roll each leaf. The good news is even if you mess up you will probably get something that tastes great. Make it for a special occasion, or a good party. If you're making grapeleaves, then you ought to show them off, er, um, I mean share. Full disclosure: I haven't owned a bottle of vanilla extract in close to 2 years. I was annually buying a big bottle of Massey vanilla to last a year of baking. I fell out of that habit when I couldn't validate the extra expense during a tight year. So yes, I have been lying. Most of the recipes I've tested/written with vanilla actually contained almond extract, vanilla powder (an odd xmas gift from way back) or vanilla beans. Vanilla beans are $0.99 each at the Flatbush co-op, about half or less what you would pay at the grocery store or online. Planning for Christmas baking I decided it was time to end my vanilla drought. 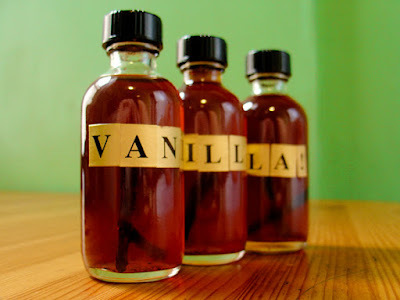 Vanilla extract isn't a magical elixir squeezed from rare plants. It's just cheap alcohol infused with vanilla beans. I can do that, so can you. You need 4 things: a bottle of cheap booze, vanilla beans, a dark place, and time. Two of those things are free.